In November 2004, the actors Song Seung-hun and Jang Hyeok bit the bullet and joined up after their attempts to dodge Korea’s mandatory military service were exposed. Twenty-four months later, the two have done their time and were discharged on Wednesday from their unit in Hwacheon, Gangwon Province. Emerging at 7 a.m. to a waiting crowd of some 500 fans and hundreds of reporters from all over Asia, Song was in pensive mood. “Finally a day that always seemed like it would be a great one has come, but when I think about having to split from my brothers in arms who I became close to, I can’t be happy,” Song said. “I made a stupid and immature decision before I entered the Army, and it hurt and disappointed my fans, but I felt that the best way ahead was to live my military life sincerely.” Song, who was part of an artillery battalion as a 155 mm gunner, vowed to “rekindle the fellowship” with the neighbors he became estranged from. 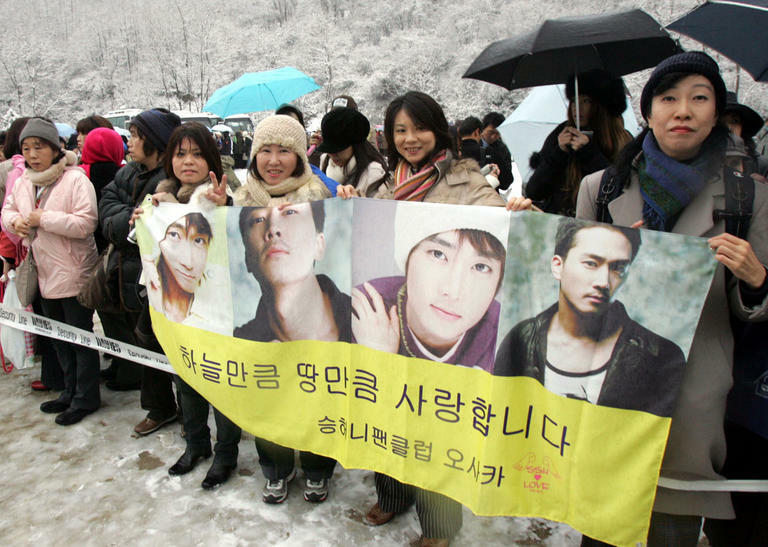 Fans from Japan, Taiwan, Hong Kong and of course Korea carried signs that read, “Korea’s best actor,” and “You’ve worked hard for two years.” Overseas fans were bussed in on 15 coaches that left Seoul at 2 a.m. but encountered a blizzard on the way and did not make it to the actor’s press conference until five-and-a-half hours later at around 7:30 a.m. According to those in the know, the fans paid from between 110,000 yen for a simple package to 220,000 yen for the expensive tours to be here for the moment when the actor regained his freedom. Normally the trip takes around three hours from Seoul, but with the sudden snowfall everyone’s trip that day took at least five. And hearing in advance that there were almost no restrooms at the base the female fans insisted on stopping every now and then at rest stops to take care of their business, which made the trip even longer. Immediately following the press conference, Song headed to Seoul to relax. But he will be meeting his fans again at a meet’n’greet event at the weekend. There are also plans for another press conference. On Thursday afternoon, an exhibition kicks off at N Seoul Tower of objects that the actor used during his days in the military. His boots, uniform and personal tools — everything except his gun — are there for fans to swoon over. Song makes his official return to the celebrity life starting with the Asia Fan Meeting 2006 at the Gymnastics Arena in Olympic Park in Seoul on Nov. 18 and 19 starting at 7 p.m.
Jang Hyeok found himself with a quieter reception on his release from a rifle corps that guarded the demarcation fence. “My brothers here, and those who joined up after me, were always unaffected and we had many conversations,” he said in a statement. “I feel relief and sorrow at the same time, and it isn’t an easy thing to step back into society.” Jang is also considering a drama role early next year. This entry was posted in News and tagged Jang Hyuk, Song Seung Heon by doozy. Bookmark the permalink. did you see pix of SSH’s fan meeting?? all those people were so lucky (and strong to go through all that trouble)!!! SSH was looking goooooooood *swoon* he was crying too 😦 anyway, glad they’re both out, good luck to them both!! !